Get fiber internet and download all the things at light speed. You hear about fiber internet speeds all the time, but what does that even mean? And should you get it for your home? We'll cover it all. Mom always told you to get plenty of fiber, so why shouldn’t her advice work for your internet connection too? Okay, different types of fiber, people, different types. But the truth is, fiber internet far surpasses DSL and cable internet in terms of speed and reliability. Here’s why fiber internet is worth the money—and here’s how to get a fiber connection of your own. Is there fiber in my area? 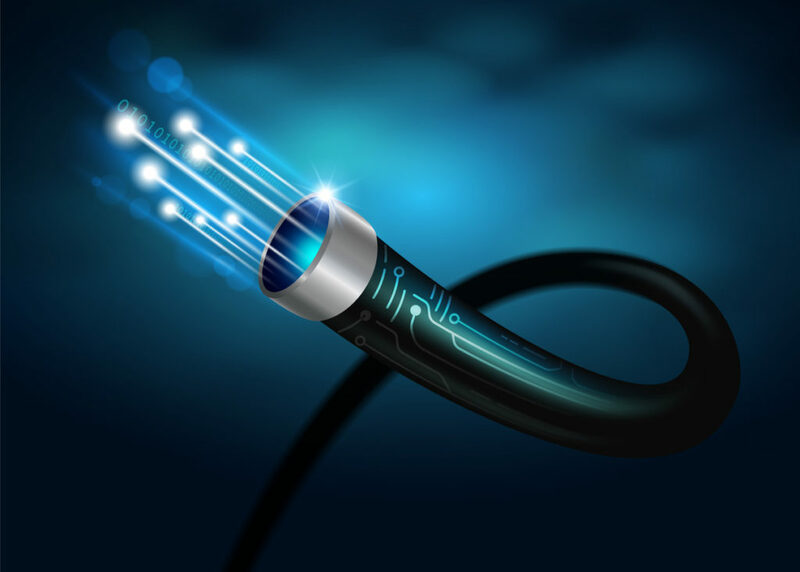 Fiber internet uses fiber-optic cables instead of copper wires. Fancy. But that may be too simple of a definition for the tech-savvy among us, so let’s dig in a little more. “Fiber-optic cable carries light very well over relatively long distances with low attenuation and distortion of the light signal,” says Frank Cornett, a retired electrical engineer for Intel. In terms of your internet connection, attenuation means the strength of the signal sent to your computer gets weaker over time. That change makes the signal harder for your computer to process overall. With fiber, the signal stays stronger so you get faster internet and better streaming. Zoom. That light signal uses binary to communicate with your computer. “. . . The presence of light might indicate a binary one and the absence of light would indicate a binary zero,” says Frank. Pretty cool. You might now be wondering why fiber is so much better at transmitting data than cable or DSL internet connections. Well, the answer lies in the types of cables used. Curious to learn more about cable internet? Check out our guide here. DSL and cable internet both rely on copper wires to transmit data—the same kind of wires that transmit your voice over a telephone line. That goes to show you just how long this technology has been around. “In contrast to fiber-optic cable, which carries light with relatively low attenuation and distortion, copper wires significantly attenuate and distort the voltage signals they carry,” Frank explains. That’s a bad thing, and it gets worse. Here’s a quick look at how quickly you can download files with fiber internet versus DSL and cable. 4-minute song 4 MB 0.03 sec. 0.03 sec. 1 sec. 9-hour audiobook 110 MB 0.9 sec. 9 sec. 36 sec. 45-minute TV show 200 MB 1 sec. 16 sec. 1 min. 7 sec. 2-hour movie 1.5 GB 12 sec. 2 min. 8 sec. 8 min. 35 sec. 2-hour HD movie 4.5 GB 38 sec. 6 min. 26 sec. 25 min. 46 sec. Who is fiber internet best for? That’s perfect if you upload a lot of files, work remotely, or livestream. Fiber internet comes in three types, and fiber to the home (FTTH) is the best. There are three types of fiber internet—and not all are made equal. Fiber to the home or premises (FTTH or FTTP) means your fiber internet connection goes straight into your home. If your home isn’t already set up to receive a fiber connection, you may need your ISP to drill holes or even dig nearby. This is the holy grail of fiber connections. Fiber to the curb (FTTC) means your fiber connection goes to the nearest pole or utility box—not an actual concrete curb. After that, coaxial cables will send signals from the “curb” to your home. This means your connection is made up of part fiber-optic cables, part copper wires. Fiber to the node or neighborhood (FTTN) provides a fiber connection to hundreds of customers within a one-mile radius of the node. The remaining connection from the node to your home is often a DSL line that uses existing telephone or cable lines. For FTTN fiber internet, this is where things get tricky. The farther you live from the node, the longer the DSL line needs to be to reach your house—and the longer the line, the more attenuation and distortion you get, causing slower internet. “With FTTN, the DSL link from the node to the home amounts to a bottleneck in the overall link,” says Frank. We don’t know about you, but bottlenecks and internet don’t sound like a match made in heaven. While fiber sounds amazing if you’re a lover of all things internet, the reality is it’s still not widely available. Right now, fiber is mostly available on the East Coast and in big cities—though there are a few small ISP startups offering fiber elsewhere. Hotwire in Maryland and Grande Communications in Texas are two that come to mind. The best way to find out if these ISPs are worth their salt is to see what real customers have to say and compare performance and pricing. We’ve got all that and more—check out our AT&T Internet, Verizon Fios, Frontier, and CenturyLink reviews. If you’re lucky enough to have fiber internet in your area, here’s how the five most widely available fiber ISPs compare.